The title of Gus Van Sant's "Paranoid Park" refers to a rough skateboard park underneath a bridge in Portland, Oregon -- a place where, they say, "dead bodies" are buried beneath the contoured cement. It also describes the confused conscience of Alex (Gabe Nevins), the emotionally isolated teenager who narrates the movie and who actually sounds like a teenager while doing it. In voiceover, Alex reads aloud from his journal as if he were delivering a book report in class, but he's trying to confess the darkest secret of his young life. Many films use scrambled chronology just to make the story seem more interesting than it really is. That's not what happens in "Paranoid Park." The story, told as Alex pencils entries into a lined notebook, is an elliptical record of how he processes the terrible thing that happened one night in the neighborhood of Paranoid Park. The narrative moves in arcs and curves, like the skateboarders who float and glide around in dreamy 8mm slow-motion, as Alex circles the truth in his writing, promising himself, "I'll get it all on paper eventually." 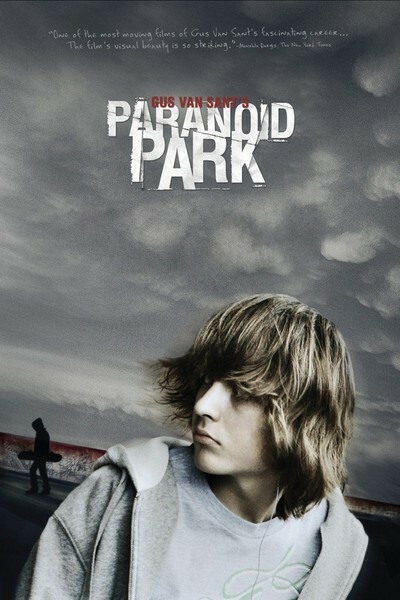 "Paranoid Park" is a companion piece to Van Sant's "Elephant" (his stylized reimagining of a typical high-school day shattered by a Columbine-like massacre) -- and, by extension, "Gerry" and "Last Days" (inspired by the suicide of rock icon Kurt Cobain). Shot mostly in Portland blues and grays by Christopher Doyle and Rain Li, the film takes us inside the gloomy, tormented consciousness of Alex. Like the kids in "Elephant" who negotiate mazes of locker-lined hallways in long, slow takes, Alex moves through space as if he were underwater. He's an outwardly sullen, nearly somnambulistic kid, and there are things going on inside him, weighing him down, that he can't quite grasp, much less articulate. As the film begins, his parents are divorcing, he's dreading the inevitable moment when his sketchy virgin girlfriend demands that he deflower her, and he's called out of class by Detective Richard Lu (Daniel Liu), one of the few adults in the film whose face is allowed to register onscreen. Detective Lu, investigating a nasty death in the train yard by Paranoid Park, inquires into his whereabouts on the night in question. The interrogation is casual on the surface and fraught with tension beneath. Alex may be telling the truth, or he may be skating around it. But what is he avoiding, and what are the consequences of his denial? Van Sant has an empathy with troubled teenagers that pierces the cliche of that phrase. He tends to cast young non-professionals who seem natural and a bit stiff, relaxed and guarded, at the same time -- capturing the inexperience of real adolescents, who often wade into depths that are frighteningly over their heads, even if they aren't aware of it. Alex comes across as an accidental teen Raskolniknov who wants to confess his guilt, but isn't really sure what he's guilty of. "Paranoid Park" is graced with those peculiar Van Sant touches of discovery and absurdity, delightful because they're at once so right and so inscrutable. Like the touching and funny scene with Alex's younger brother in which he sits on Alex's bed and incomprehensibly recounts scenes from a movie (see how long it takes you to figure out which one). Or the slow-mo shot in which all the skater kids are called to the principal's office and they line up in the hallway, striding toward the camera like a secondary-school "Wild Bunch." Or Detective Lu's clueless reference to a mythical group he calls "the skateboard community." Or the quotations from Nino Rota's circus-like score for Fellini's "Juliet of the Spirits" playing against the rainy chill of a Northwest day.